FREEDOM: What the United States Constitution and Bill of Rights once guaranteed to all American Citizens. PNAC: Our wars for oil and profit were planned LONG before 9/11, but an excuse was needed to justify them. 9/11: The excuse that was needed to sacrifice lives and liberties while corporations raided our treasury. AUMF: Authorization for Use of Military Force (Public Law 107-40), a “war against terror” carte blanche. PATRIOT ACT: 68,000 words worth of Orwellian “1984” legislation supposedly drafted and passed in six weeks. CITIZENS UNITED: The U.S. Supreme Court decision that gave corporations a legal way to buy U.S. elections. 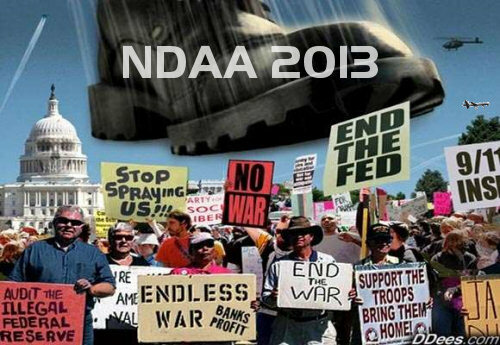 NDAA: The National Defense Authorization Act of 2012, which codifies indefinite detention without trial. SOPA/PIPA: The proposed Stop Online Piracy Act and Protect IP Act, euphemisms for Internet censorship. EEA: The proposed Enemy Expatriation Act, under which dissent could result in revocation of citizenship. 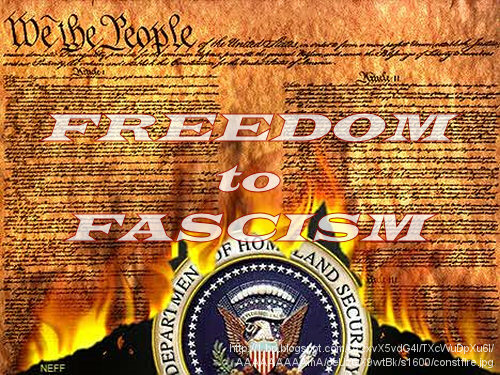 FASCISM: Rule by corporate elite we can only reverse by waking up 312 million mostly clueless Americans.